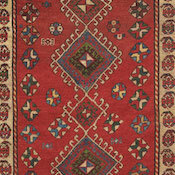 Gendje is a town centrally located in the midst of the traditional rug-weaving area of the Caucasus Mountains. 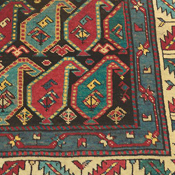 Situated on the main road connecting Baku and Tbilisi, the capital of Georgia, the name Gendje also refers to the mountainous area surrounding the town. 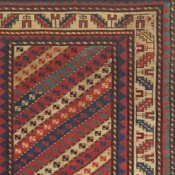 “Gendje rugs were frequently made in a long, narrow format, and a large number of runners were produced too…the polychrome octagon borders…can be identified as distinctive features of Gendje weaving… Another design that is associated with Gendje is a diamond-shaped medallion, often with a white outline that curves outwards and opens up on each vertical side of the medallion. 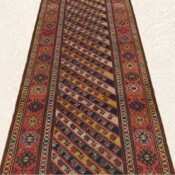 The effect is that there is a lateral opening on each side of the medallion” (Middleton, Michael, Rugs & Carpets: Techniques, Traditions & Designs. 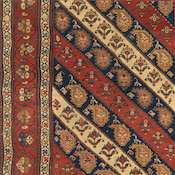 Mitchell Beazley, London, 1996, p.55). 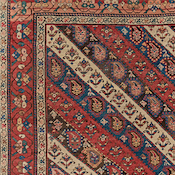 For instance, the 19th-century tribal rug to the right is an exquisite example of the Gendje runner format as well as the polychrome octagon borders particular to Gendje antique rugs. 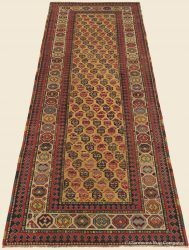 In addition, a prized saffron ground instantly sets apart this brilliantly executed Caucasian antique rug, commanding rapt viewer attention. 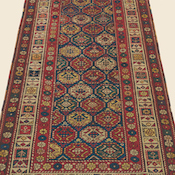 Of equal importance to this seldom seen golden hue is this antique Caucasian rug’s exquisite suite of inventive, precisely crafted borders, each presenting a multitude of subtly inflected natural hues for an unusually impressive sense of dynamic harmony and movement. 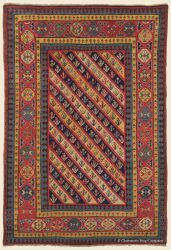 While some Gendje antique rugs feature the distinctive elements discussed above, “many antique Gendje rugs look very much like those produced by their neighbors, Kazaks in particular… Kazak rugs and Gendje rugs both feature wool warps and a long, Thick pile. 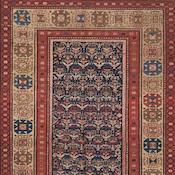 However, many Gendjes have un-dyed cotton (or pale red woolen) wefts”(ibid, p. 55).